Disclosure: We received a product. All opinions stated however, are genuine and my own. Available at most major retailers or at the Hasbro Toy Shop. My youngest child, happily, is one of those kids who uses his imagination (liberally). He also loves to build. I was looking for the perfect gift for him, one that he hasn't asked for (I love to give presents I know people will love but they are not expecting! 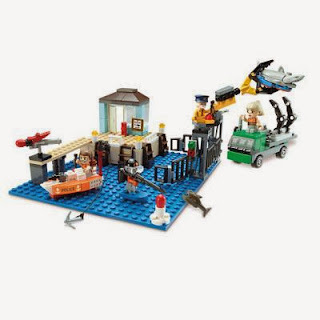 ), and the KRE-O Cityville Invasion Marina Madness Building Set fits the bill. I know he'll love the opportunity for the imaginative playtime that this toy presents, and he will flip for the moving pieces, yes building pieces that move (how cool is that???)! 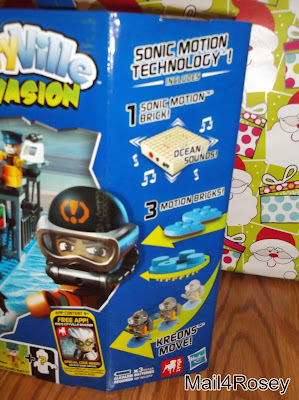 Motion Bricks allow Kreons to move! I admit that I haven't heard of Zynga's mobile gaming app: KRE-O Cityville Invasion (I just liked the kit in and of itself), but it seems to be very popular, and that could be a definite added bonus if you're shopping for someone who uses/is a fan of the app. There is also a special code inside that unlocks game content. With the (4) popular characters Ray Manta, Sgt. Splash, Dockhand Rusty, and Lt. Mari Time (lol, loving the names! ), 206 building pieces, a mystery figure, Sharktooth (the aquatic predator), a Sonic Motion brick, and (3) motion bricks, the kit has more than enough to keep the imagination busy. When you are shopping for toys (and most of us are this time of year), it is important to look for quality. Everyone knows the HASBRO name, and there are good reasons for it: Their toys are top notch quality and kids love them! Add in affordability, and that's a win-win-win in my book. The KRE-O Cityville Invasion Marina Madness Building Set is fun, costs just under $20, and is definitely a most excellent gift idea for the upcoming holidays. It can be purchased at most major retailers, and/or at the Hasbro Toy Shop online. You can learn more about KRE-O and Hasbro Toys by visiting their websites. My two LOVE building sets like this and I have a feeling that they would go bananas over this set. Wow, how neat! This would be so great for my nephews. I like to give them creative, but educational and time consuming toys. I have been hearing a lot about these sets lately (all good things lol). I have a nephew that would love to have a few! 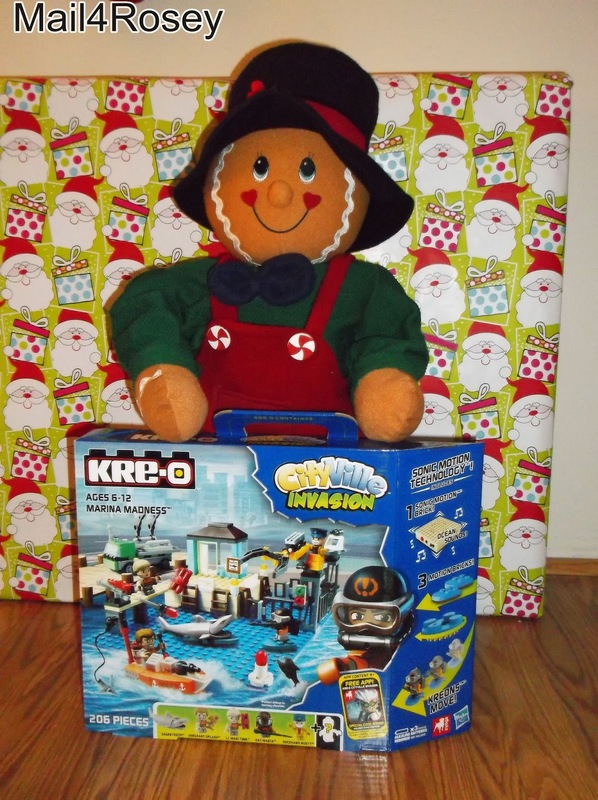 The KRE-O Cityville Invasion Marina Madness Building Set sound like the perfect gift for my Grandson. He has such an imagination and we are always trying to keep him from being bored. I think I would even love it - and I'm the mom! These would be perfect for my nephew's birthday gift! Having no children I never heard of these characters or the apps. Maybe if my friends son hadn't grown up I would have because dimes to donuts-he would have gotten me to buy it for him! I haven't ever heard of this app, but I bet my nephew would love this set. It's always fun to build things! Even for us older kids. Hasbro was always the go to toy company when my kids were young. I see nothing has change. Quality toys for sure. My youngest and I spend hours building blocks, I would love to have this set added to what we have. My daughter has a bunch of these and she loved them! Oh how my boys would love this! I lovw toys that stretch a little one's imagination. KRE-O looks like it could provide hours of fun. Love the tech part of the kit too. My nephew would love to play with this set! He needs to get this for Christmas. I need to tell my sister about this awesome toy to help him have hours of fun! Your little guy will love this. My oldest still likes to build with sets like this. Right around Halloween he received two KRE-O sets that were pretty spooky! I just love all the details in this set. I've never seen one up close so this is really cool! If I had a boy I would be all over this! Thanks for sharing I have some friends that have little boys that would love it! This would be perfect for my son next year! Plus at a decent price point! YAY! Ooh, this might be added to somebody's Christmas list. Thanks for the video and photos. Looks really fun! This looks like a good one for my library kids to have a building contest! Ok, it's really for me. I love this building set. My boys love to build things with their hands so they would really enjoy playing with this. I love these toys. I don't have them, but I love the idea behind them. This looks like a great little toy at a reasonable price Thank you for this review. Glasstic Water Bottles are Awesome! Are There Any Bowlers in the House? "Blessings," a Personalized Book from FlattenMe!